“Ego sum. My name is known. God and King.” The masked figure resplendently gowned in gold and white, stands at the highest point of a scaffold. Behind him is the Norman arch of Lincoln Cathedral, begun in 1072. God and a panoply of Christian characters speak verse from a medieval manuscript, one of only four extrant from England’s great period of religious drams- the Middle Ages. Today, the effect may not be as profound as the last production of the play- four centuries ago. But the drama has dimensions byond those of a religious and communa celebration. …A wide sense of community is evident in the audience. “priorto our June 22 opening, 95% of bookings were from outside of Lincolnshire,” says Mr Ramsay. “One woman phoned for tickets from Borneo.” On the night I saw the Lincoln Cycle, I sat in the square outside the towering cathedral between a Japanese professor and a German businessman. 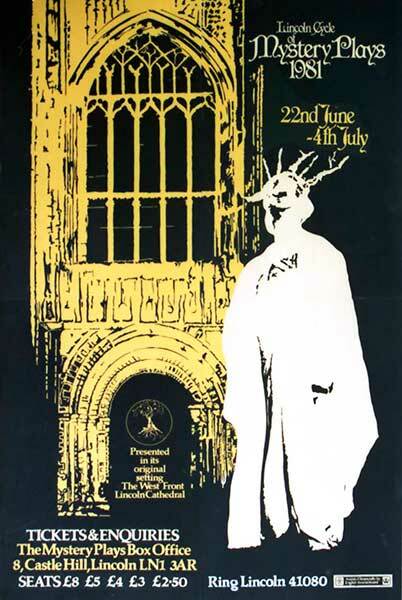 “Last night for the first time in 500 yeras, the Lincoln Mystery Plays were peformed in their original setting before the Monarch’s Door on the West Front of the ancient Cathedral. …Unlike the more familiar York cycle, in which plays were a handicraft of many guilds, the Lincoln plays were probably scripted by traveling priests or monks. The local archives have many manuscripts to prove the continual use of the script within and around the cathedral, the medieval sponsors, being the local craftsmen’s guild of St Annes. …There are 15 simple home-spun playsand as such they aregiven. There are no frills. we are always at the hart of Medieval life, the humours are broad, the voices roughened. The company also included Ann Kellett, Frances Parker, Joanna Lucas, Miranda Lee, Laura McGinlay, Di Hughes, Gudrun Hughes, Morag Hughes, Denise Stock, Jane Marschner, Ruth Warren, Helen Rollinson, Katy Middleton, Maria Kennedy, Anne Rigby, Bill Rigby, Rebecca Rigby, Andrew Rigby, Katy Mayes, Owen Mayes, Justin Lavash, Leslie Bedford, Brian Story, Linda Durance, Anne Atkinson, Debbie Bulley, Rebecca Knox, Sarah Knox, Clare Hazeldene, Tom Pye, Maureen Robshaw, Helen Robshaw, Janet Littleover, Caroline Wilson, Jill Gordon, Christine Reynolds, Jo-Ann Empson, Sarah Mander, Sonya Clay, Annie Hall, Guy Hall, Naomi Hall, Kate Hall, Chantelle Thornley, Jeannine Thornley, Helene Jones, Simon Horton, Sarah Kent and others. John Bannister, Jane Hall, Cathy Simmons, Viv McVeagh, Jo Gadsby, Cathryn Turner, Tim Ball, Judith Faux, Angela Austin, Elizabeth Miller, Debbie Burbridge, Peter C Wellsted, Barbara Beard, Jackie Mitchell, Linda Pearce, Sarah Mitchell.